(Boston) - Researchers from Boston University have discovered the remnants of the largest crater of the Great Sahara of North Africa, which may have been formed by a meteorite impact tens of millions of years ago. Dr. Farouk El-Baz made the discovery while studying satellite images of the Western Desert of Egypt with his colleague, Dr. Eman Ghoneim, at BU's Center for Remote Sensing. The double-ringed crater - which has an outer rim surrounding an inner ring - is approximately 31 kilometers in diameter. Prior to the latest finding, the Sahara's biggest known crater, in Chad, measured just over 12 kilometers. According to El-Baz, the Center's director, the crater's vast area suggests the location may have been hit by a meteorite the entire size of the famous Meteor (Barringer) Crater in Arizona which is 1.2 kilometers wide. 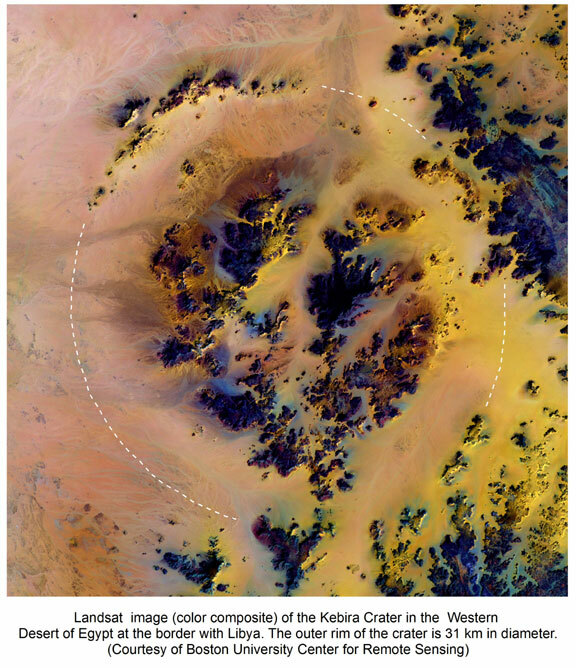 El-Baz named his find "Kebira," which means "large" in Arabic and also relates to the crater's physical location on the northern tip of the Gilf Kebir region in southwestern Egypt. The reason why a crater this big had never been found before is something the scientists are speculating. "Kebira may have escaped recognition because it is so large - bigger than the area of 125 football fields, or the total expanse of the Cairo urban region from its airport in the northeast to the Pyramids of Giza in the southwest," said Dr. El-Baz. "Also, the search for craters typically concentrates on small features, especially those that can be identified on the ground. The advantage of a view from space is that it allows us to see regional patterns and the big picture." The researchers also found evidence that Kebira suffered significant water and wind erosion which may have helped keep its features unrecognizable to others. "The courses of two ancient rivers run through it from the east and west," added Ghoneim. The terrain in which the crater resides is composed of 100 million year-old sandstone - the same material that lies under much of the eastern Sahara. The researchers hope that field investigations and samples of the host rock will help in determining the exact age of the crater and its surroundings. Kebira's shape is reminiscent of the many double-ringed craters on the Moon, which Dr. El-Baz remembers from his years of work with the Apollo program. Because of this, he believes the crater will figure prominently in future research in comparative planetology. And, since its shape points to an origin of extraterrestrial impact, it will likely prove to be the event responsible for the extensive field of "Desert Glass" - yellow-green silica glass fragments found on the desert surface between the giant dunes of the Great Sand Sea in southwestern Egypt. Dr. El-Baz is research professor and Director of the Center for Remote Sensing at Boston University. He is a renowned geologist who over the past 30 years has conducted studies in all the major deserts of the world. He is a member of the U.S. National Academy of Engineering and a Fellow of the American Association for the Advancement of Sciences and the Geological Society of America. The latter established the "Farouk El-Baz Award for Desert Research" to reward excellence in arid land studies. Dr. Eman Ghoneim is a research associte at the Center for Remote Sensing. She is an expert in hydrological modeling and now conducts research on arid land geomorphology with emphasis on groundwater concentration under the direction of Dr. El-Baz. The Boston University Center for Remote Sensing is a research facility that was established in 1986. Researchers at the Center apply techniques of remote sensing and geographic information systems (GIS) to research in the fields of archaeology, geography and geology. In 1997, the Center was recognized by NASA as a "Center of Excellence in Remote Sensing." Founded in 1839, Boston University is an internationally recognized institution of higher education and research. With more than 30,000 students, it is the fourth largest independent university in the United States. BU contains 17 colleges and schools along with a number of multi-disciplinary centers and institutes, which are central to the school's research and teaching mission.